At one of the recent Baildon Ukulele Club nights I was given the opportunity to play a new soprano ukulele made by Clifford Essex Music (on the Clifford Essex website it’s called “the Clifford Essex Popular Soprano Ukulele”). 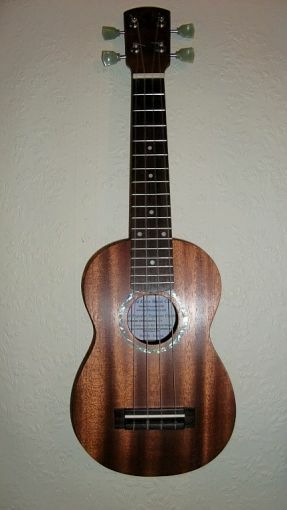 Although I predominantly play a baritone ukulele I do have a soprano – in fact, that’s what I played when I first joined the club, so I am fairly familiar with the instrument. Being somewhat of a musical magpie I like to try any instrument another player may give me the chance to play. So, needless to say, I jumped at the opportunity to test out this ukulele. At first glance, the instrument is quite striking. The wooden body, neck and headstock are a beautiful dark brown finish but the eye is immediately drawn to the oversized tuning pegs. They are at 90 degrees to the headstock and so stick out rather like oversized ears and are a sea green colour which picks out the same colour in the leaf motif found in the decorative rosette band around the soundhole and on the headstock. Yet the colour doesn’t clash with the finish. Discordant as it initially appears I find that, after a short while, I’m endeared by them as everyone notices them and thereby notices this ukulele. The build quality of the instrument is superb. All joints are solidly constructed and finished to a very high standard which translates to giving the ukulele a very solid feel (in contrast to the bargain basement end of the market from which my own soprano was bought). This ukulele has a warm and tactile quality from the unpainted, unvarnished wood which makes handling and playing it very pleasant. The subtle, decorative rosette band inlaid around the soundhole which, as mentioned, matches the design of the badge/logo on the headstock adds just the right amount of dressing. Having tuned up I begin to play a few chord runs C to C7 to F – a typical chord progression for many ukulele songs. The uke’s sound is thankfully free of unseemly buzzes from loose fittings and rattles from the strings on the fretboard again underlying the quality construction. I repeat the progression a number of times and am struck by the volume that can be found in the voice of this small instrument. This is great because this small soprano ukulele will not struggle in an ensemble situation. Strumming over and around the soundhole the tone is bright and full of treble but as I strum further up the neck the tone becomes mellower and much warmer. Softer strums here allow this mellow sound to complement the softer minor and major seventh chord sequences I’m now playing. The ukulele’s voice has changed to suit the mood I’m in, which is a good quality for any musical instrument to have. The tuning holds perfectly well from an initial tuning through my rapid full-handed strums, to single loud strums held for a beat and even into more delicate fingerpicking. The level of sustain for a single strum is very good and the instrument doesn’t die off midway through the bar while I’m holding the chord. Fingerpicked arpeggios and individual melody runs are perfectly clear. Even though this is a soprano and I more usually play the baritone, adjusting to this instrument’s size takes no real time. There is plenty of space on the fretboard to form chords that require all four fingers on the neck (C#dim is one I use regularly). When picking the strings I find I can pick them cleanly using two or three fingers without inadvertently striking the wrong string (the ability to use four fingers is not a restriction of the instrument rather an absence in my personal skillset!). The ukulele is well set up in terms of its action that it doesn’t feel like I’m strangling it and I can shift moveable chord shapes up and the down the neck with ease. Likewise, barring a single finger across all four strings doesn’t require a vice-like grip in order to maintain a good sound. All in all I’m pleased with the way this instrument plays. Would I buy it? Sound advice indeed and this ukulele from Clifford Essex Music is indeed a proper instrument. From start to finish playing it has been a real treat and I would highly recommend this soprano ukulele.